JAX-RS client issues SAML token itself (using interceptor) and sends it to the JAX-RS service. JAX-RS client delegates creation of SAML token to SecurityTokeService (STS) and sends the received token to JAX-RS service. The first approach is briefly described in CXF Wiki and illustrated in this system test. The second approach helps to resolve these drawbacks using central SecurityTokenService (STS) to issue the SAML tokens. 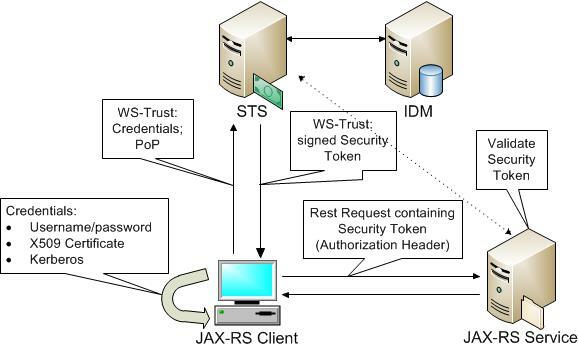 In this case JAX-RS client communicates with STS using WS-Trust protocol and delegate creation of SAML Token to STS. This post describes mainly the STS based approach. JAX-RS Service extracts SAML token, verifies STS certificate, signature and expire date. Optionally JAX-RS service can delegate validation of SAML token to STS. x509Endpoints bean in cxf-servlet.xml contains the list of JAX-RS Service endpoints for which SAML will be issued. Currently STS configured to accept any service endpoint. STS can be either deployed to tomcat as war or started used tomcat plugin (start mvn tomcat7:run). X509 authentication doesn't requires HTTPS. In CXF versions < 3.1.2 it was required to configure complete STSClient in order to communicate with SecurityTokenService. The change request #CXF-6267 helps to make this configuration a bit easier. The SamlHeaderOutInterceptor is required to set received SAML Token into authorization header. In case of X509 based authentication client sends to STS request, containing user certificate and signed with user private key. STS validates the certificate and checks the signature. If both are valid, Proof Of Possession (PoP) is successful and STS issues SAML Token for this user. SamlHeaderOutInterceptor inserts SAML received from STS into HTTP request Authorization header. JAX-RS service certificate as trusted entry to establish SSL connection with JAX-RS service (myservicekey alias), see Client SSL Configuration for details. I used the same clientstore.jks for SSL communication as in STSTokenOutInterceptor. Now JAX-RS service will be able to compare SSL client certificate and certificate from SAML token and ensure that the client owns private key corresponds to this certificate. I configured default STSTokenValidator and specifies serviceKeystore.properties as signature properties. JAX-RS client certificate as trusted entry to establish SSL connection with JAX-RS client (myclientkey alias), see Client SSL Configuration for details. The JAX-RS service will receive request with SAML token, extract the token, validate expire day, conditions, signature, verifies trust relationship with STS server and Holder Of Key Subject Confirmation using SSL client certificate. If all validations are successful - service operation will be called, otherwise client will receive 401 Unauthorized response.